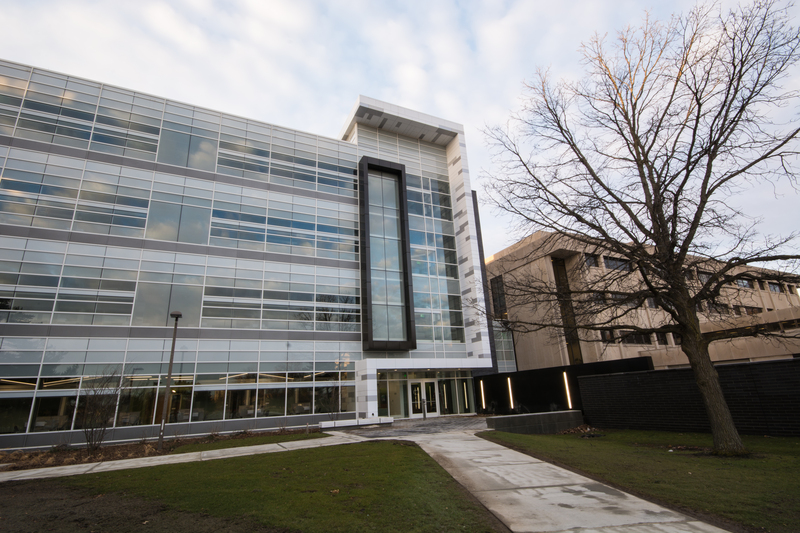 Michigan State University (MSU) opens the doors to its new Bio Engineering Facility and to new, collaborative research opportunities contributing toward technology transfer to the private sector and the state's emerging bio-based economy. The four-story, 130,000-square-foot research laboratory building is located in the South Academic District in East Lansing. The Bio Engineering Facility's design team included MSU and architectural/engineering consultants Integrated Design Solutions (IDS). A palette of gray, white and black in glass and metal distinguish the new facility from both the traditional red brick of the campus standard and beige of the cast concrete of the more recent structures. "The color was selected... to somewhat match the color palette and context of the surrounding buildings," explained Jeff Kasdorf, MSU's Infrastructure Planning and Facilities' design representative. "We did not however want to replicate the precast concrete or metal panel that was used in the adjacent facilities." IDS senior associate and project architect, Kevin S. Marshall, AIA, LEED® BD+C, agreed, "The facility had to blend into the campus, tie into its surroundings, but also stand out as its own destination." 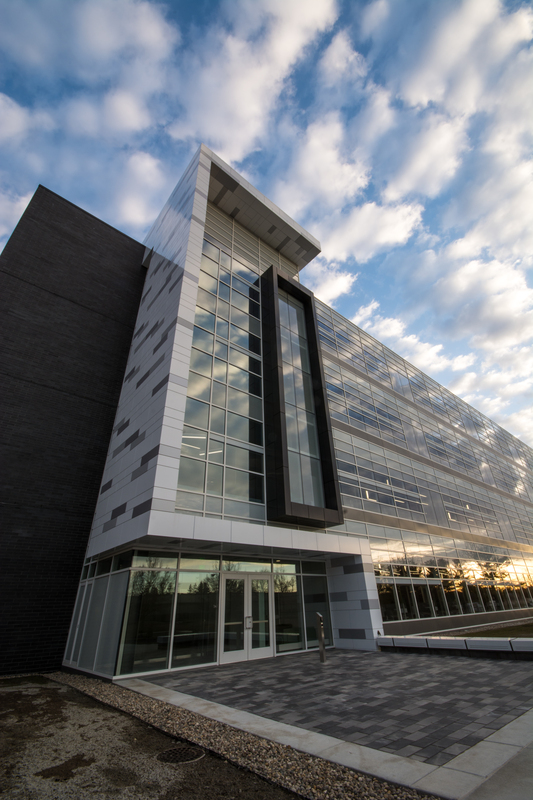 Essential to the building's aesthetic and function, Tubelite Inc. provided the Bio Engineering Facility's curtainwall and entrance systems. Linetec finished all of Tubelite's aluminum framing in Valspar's Fluropon® coating systems in Bone White. "Getting the white just right was important," emphasized Marshall. "We wanted the white of the curtainwall and the metal panels to match. We didn't want one to look dingy or dirty compared to the other." "Utilizing the latest technologies to analyze and formulate thousands of color variations ensures creation of the exact color specified," said Linetec's senior marketing specialist, Tammy Schroeder, LEED Green Associate. "Valspar's Fluropon coatings offer the ultimate protection in building performance and lasting color." Valspar's premium Fluropon systems are comprised of 70 percent polyvinylidene fluoride (PVDF) proprietary resins for field-proven, exterior quality finishes that meet or exceed the American Architectural Manufacturers Association's stringent standard, AAMA 2605 high-performance exterior specification. Fluropon demonstrates reliable performance, including resistance to harmful ultraviolet rays, chemical degradation, abrasions and humidity. Durable finishes contribute to the project's longevity and reduce the need for maintenance throughout its life cycle. Linetec's industry-leading practices also safely capture and destroy the volatile organic compounds (VOCs) present in liquid paints at the factory before arrival on the building site to support green building goals, such as MSU's sustainability guidelines. Further contributing to green campus projects, the aluminum used to produce Tubelite systems was extruded using EcoLuminum™, a high recycled-content aluminum billet composition. According to MSU's Infrastructure Planning and Facilities: "Collaboration between researchers from different disciplines, ranging from chemical engineering, electrical engineering and mechanical engineering to pharmacology, physiology and radiology, will be essential in the development of new areas of research, such as tissue engineering. The new laboratory space will provide research capacity necessary to support new hires and funded researchers in the area, and allow collaborators from different academic units to be co-located." MSU's Infrastructure Planning and Facilities involved IDS early in the Bio Engineering Facility's development to ensure the strategic, aesthetic and performance goals were achieved. Construction started in September 2013 and was completed in December 2015. Ken Gottschalk, MSU's Infrastructure Planning and Facilities' construction representative, oversaw the $57.7 million budget and worked closely with Clark Construction Company on the multi-phased timeline. "Because this is a multi-disciplinary research facility, it did not need to hold to an academic calendar," said Marshall. "The first phase focused on the building envelope, shell, core and first two floors. The other two floors were then built to include wet-bench research laboratories, offices and additional collaborative space, such as shared equipment areas." Within the Bio Engineering Facility, laboratories have an open-floor design and their modular construction provide flexibility as the nature of research evolves. "The design of the new building features a four-story atrium with an artistic stairway configuration that resembles a giant DNA strand. The terrazzo flooring design mimics a nerve cell pattern," described IDS vice president and director of workplace architecture, Jeffrey D. Johnson, AIA. Marshall elaborated, "On the exterior, the curtainwall design corresponds to the activity taking place inside. The communal spaces are represented by tall sections of curtainwall and the workstations by the shorter sections. While the exposed structure allows for tall floor-to-floor spans, we chose to emphasize the horizontal." Bringing the architectural vision to reality, Glazing Solutions installed Tubelite's entrance systems and its 400 Series curtainwall with 5-inch-deep back members. Tubelite's Narrow Stile and Wide Stile Doors were selected with continuous hinges and subframes. The aluminum-framed doors' tie-rod assembly is as durable as welded-corner construction, but can be modified, disassembled or resized in the field for a precise fit. 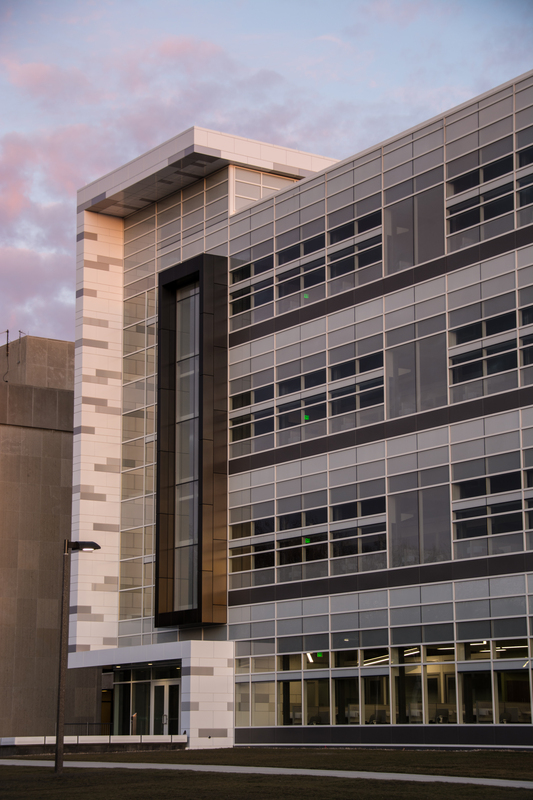 Engineered for low- and mid-rise applications, like MSU's four-story Bio Engineering Facility, Tubelite's 400 Series curtainwall's durable framework provides exceptional structural performance, reducing the need for steel reinforcing. Complementing the curtainwall, a ribbon of tri-colored composite metal panels further defines the main entrances. Black brickwork and stainless steel rainscreens carry the facility's color palette from exterior to interior. "Along with providing a leading-edge facility that helped change the way scientists work, the university's top performance objective was the ambitious goal of 50 percent overall energy savings," noted Johnson. "The result was a groundswell of cooperation and support to reach new heights in energy savings." Walt Lutzke, Tubelite's marketing coordinator, observed, "Research laboratory facilities are well known for being energy consumers, not conservationists. It's an impressive achievement and we were glad to be involved." 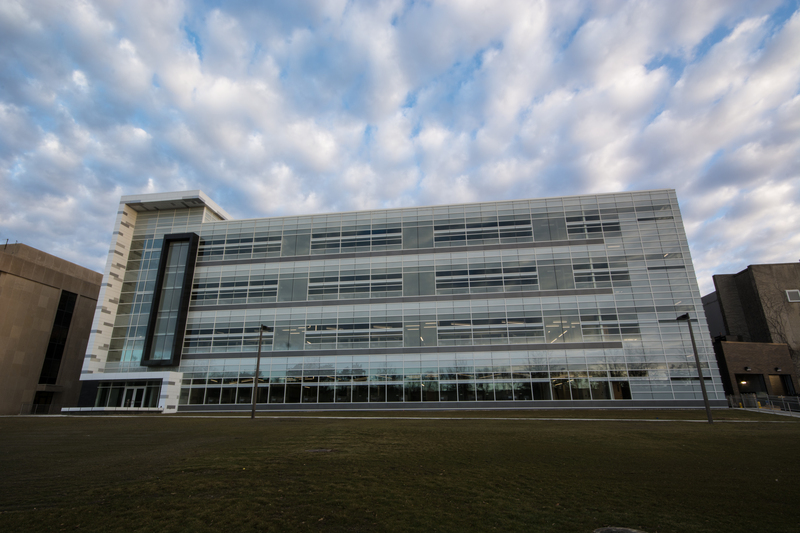 In addition to the MSU-owned co-generation plant and Bio Engineering Facility's energy recovery systems, Tubelite's curtainwall system also contributes to this achievement. "The curtainwall provides thermal performance, and manages solar heat gain and condensation risk, as supported by the insulated and low-e coated glass," explained Marshall. Guardian Industries supplied the raw glass and Oldcastle fabricated the insulated glazing units. Making installation as easy as possible, Tubelite' 400 Series curtainwall uses an exterior screw-applied pressure bar to secure the glass in place. The high-performance curtainwall system provides year-round comfort and supports heating and cooling cost savings. Marshall continued, "Throughout the building's façade, there's a graduated pattern from transparent to solid. Two types of silkscreened patterns were used: one with 40 percent dots and one with 80 percent dots. Its subtle shading cuts down on glare. On the south side of the building, there's also interior light shelves and automated shading to help control and direct the natural light." "Across the country, 40 percent of the energy used is from buildings. By investing in highly efficient energy-control systems, we can save money that can be better used for academics," Dan Bollman, assistant vice president for strategic infrastructure planning and facilities at MSU, told the Lansing Business Review. "We are always looking to improve the quality and quantity of the research we do. This facility will advance science and strengthen our research portfolio." Stephen Hsu, MSU vice president of research and graduate studies, concluded, "This building, with its emphasis on bringing together engineers and basic science researchers with medical researchers, will provide us with remarkable opportunities for solving some of humanity's biggest challenges. It also will help us attract more competitive, nationally funded projects and recruit the best minds to work with us – both faculty and graduate students."